Whimzees Stix Dog Chews have been made from 100% natural compounded vegetable fibres to be a completely edible treat for your dog to enjoy. 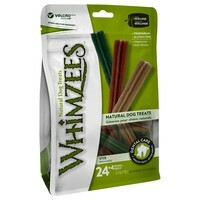 Made with a unique vegetable based surface texture created in an exciting shape, Whimzees Stix will stimulate the blood flow in your dog’s gums, preventing bad breath, and removing plaque and tartar from their teeth as they chew. Free from gluten, sugar and artificial flavours, the chews also contain malt extract and yeast that helps to improve metabolism and muscle tone, while promoting strong bones and a healthy, shiny coat.